so we got out the stash and began. i set out to make a cat, but about the time i put little dots of pink in its ears, it began to look more like a frog. so felting lesson #1: you may not be making what you thought you were making. 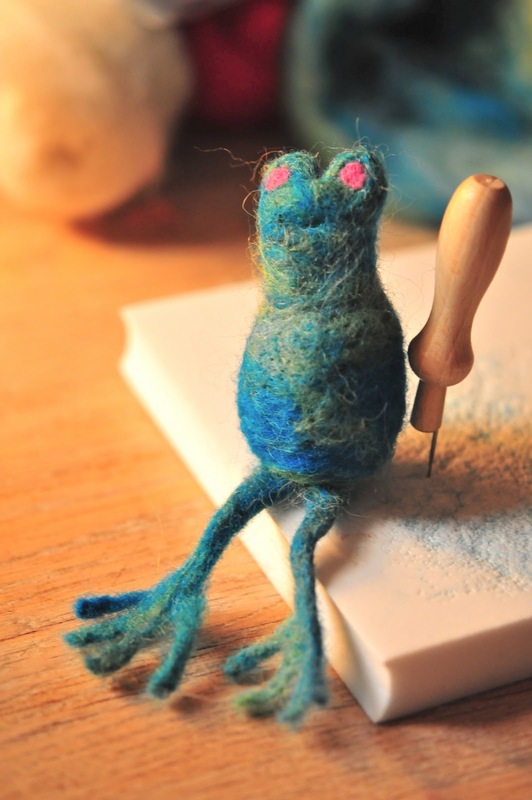 felting lesson #2: it hurts really badly when you poke yourself with that needle. felting lesson #2a: you will do this rather more often than you'd like. felting lesson #4: it is possible to poke the felting needle all the way through your finger - in one side and out the other. felting lesson #5: that hurts like crazy. this is frode frø - a little green frog. he likes macs too. and i'm amazed how a bit of fluffy wool can become a little character. felting lesson #6: the felting books do not adequately convey the magic of the alchemy that happens between needles and wool. i wish some of those fabulous felters out there that i know would write a really good book about this amazing craft. this is a hint to you and you. I don't understand how felting works but I agree, the things made have such amazing character and liveliness! mr. frog is fantastic and so is your post. i do a version of felting when i make my christmas stockings but nothing just out of the chaos. hats off to you! Totally dig the feet on this guy. He is so cute though, he really does have some character.